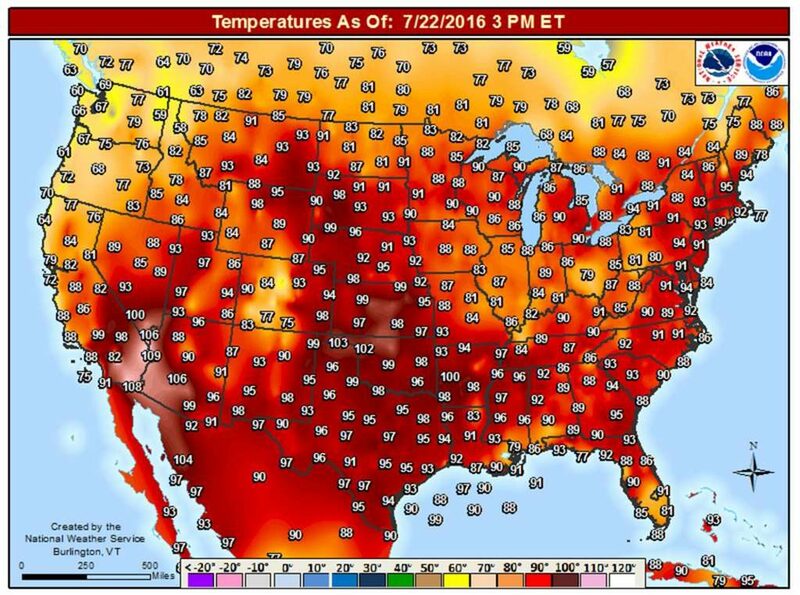 It’s HOT outside. Inside, too, without functional climate control we rely on in the 21st century for comfort. 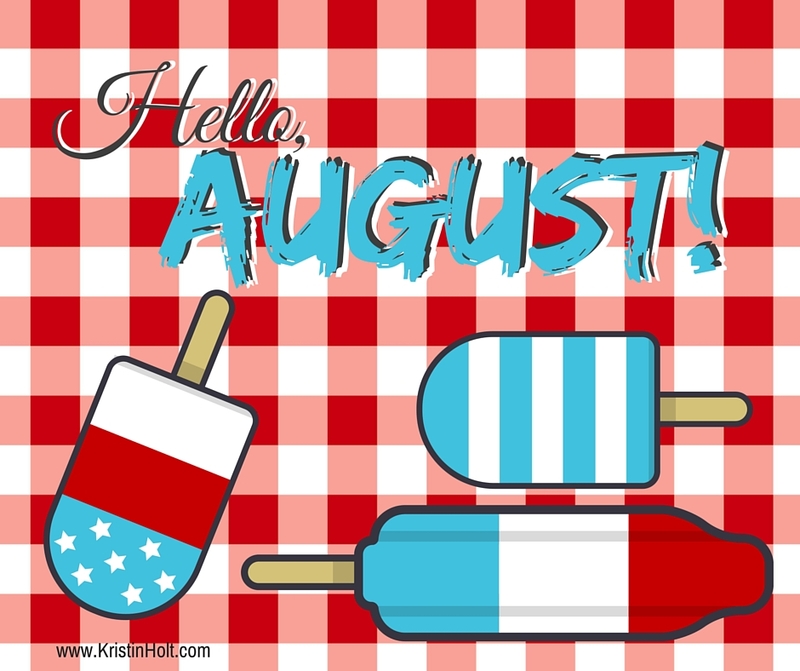 We think nothing of abundant ice for beverages, ice for coolers when camping or filling a kiddie pool with chipped ice and cans or bottles of beverages when hosting a backyard BBQ. We want milk COLD, ice cream FROZEN, and Diet Pepsi ON ICE at the convenience store. 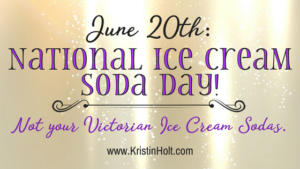 What did our Victorian-era ancestors do to keep perishable food from spoiling rapidly in this abominable heat? 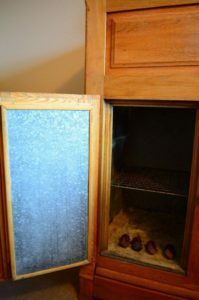 Iceboxes date back to the days of ice harvesting, which had hit an industrial high that ran from the mid-19th century to the 1930s, when the refrigerator was introduced into the home. 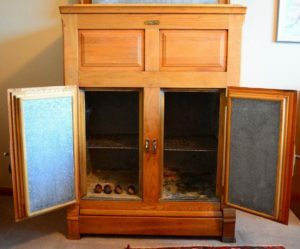 Iceboxes had hollow walls that were lined with tin or zinc and packed with various insulating materials such as cork, sawdust, straw or seaweed. 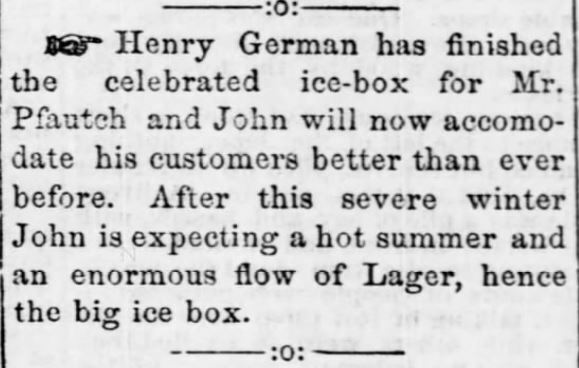 A large block of ice was held in a tray or compartment near the top of the box. Cold air circulated down and around storage compartments in the lower section. Some finer models had spigots for draining ice water from a catch pan or holding tank. In cheaper models a drip pan was placed under the box and had to be emptied at least daily. The user had to replenish the melted ice, normally by obtaining new ice from an iceman. Note: See my next upcoming blog post containing more information about ice companies, ice delivery, construction of ice houses, and more. 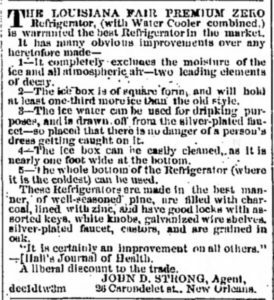 This informative advertisement, titled THE LOUISIANA FAR PREMIUM ZERO REFRIGERATOR was published in The Galveston Daily News of Galveston, Texas, on February 3, 1867. A full transcription of this scanned image immediately follows. (The historic image either didn’t scan well or had retained poor clarity in the 150 years since its printing.) 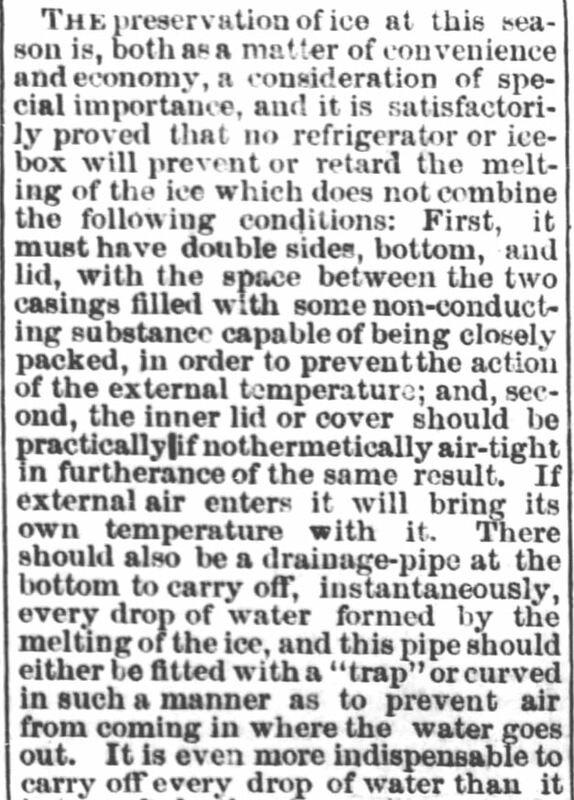 Note: At publication (1867), this ad references “the old style” (more rectangular, apparently), drinkable ice water, and calling the icebox a Refrigerator. THE LOUISIANA FAIR PREMIUM ZERO Refrigerator, (with Water Cooler combined,) is warranted the best Refrigerator in the market. 1- It completely excludes the moisture of the ice and all atmospheric air–two leading elements of decay. 2- The ice box is of square form, and will hold at least one-third more ice than the old style. 3- The ice water can be used for drinking purposes, and is drawn off the silver-plated faucet–so placed that there is no danger of a person’s dress getting caught on it. 4- The ice box can be easily cleaned, as it is nearly one foot wide at the bottom. 5- The whole bottom of the Refrigerator (where it is the coldest) can be used. 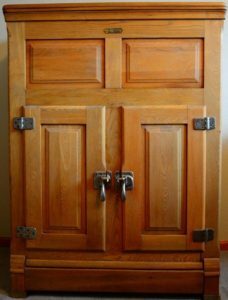 These Refrigerators are made in the best manner, of well-seasoned pine, are filled with charcoal, lined with zinc, and have good locks with assorted keys, white knobs, galvanized wire shelves, silver-plated faucet, castors, and are grained in oak. 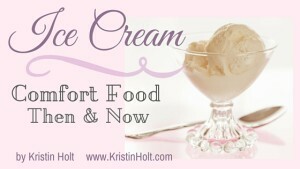 “It is certainly an improvement on all others.” ~ Hall’s Journal of Health. A liberal discount to the trade. JOHN D. STRONG, Agent, 26 Carondelet st., New Orleans. 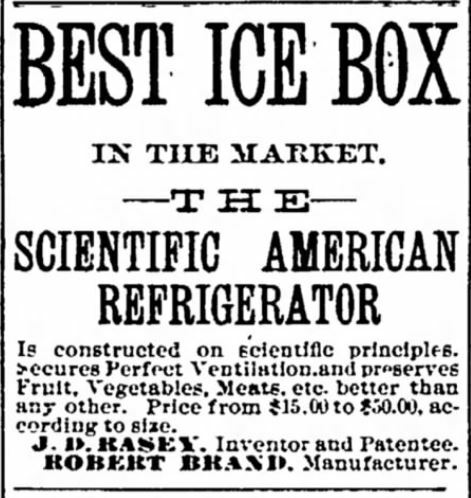 Twenty years later, the Scientific American Refrigerator icebox advertisement mentions not only the inventor and pantentee but the manufacturer and a price range ($15 to $50, according to size). 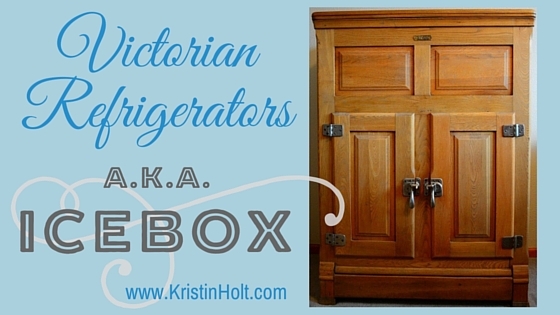 The bottom shelf was consistently the coldest in Victorian-era iceboxes, simply because cold air sinks. This natural movement of air as hot(er) air rises and cold air falls kept the lowest shelf the coldest and hence the best place for dairy products and raw meat. Raw meat on the bottom also kept meat juices from dripping onto vegetables, fruits, or cooked meats. Manufacturers warned owners to refrain from lining the metal mesh shelves with paper as doing so would impede the flow of air and promote spoilage. 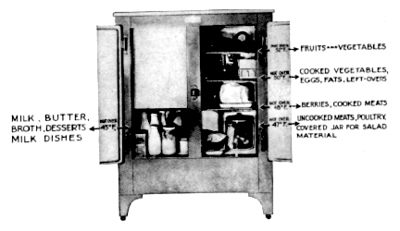 Image of Icebox with food properly stored. Image: Public Domain. Icebox currently for sale on ebay. As this icebox is currently for sale on ebay, I’m able to share the seller’s dimensions of the item: LENGTH: 35″ | WIDTH: 20″ | HEIGHT: 47″. Icebox currently for sale on ebay. Open doors show food storage area. Icebox currently for sale on ebay. Open lid reveals ice compartment. Directions posted inside lid of icebox, currently for sale on ebay. 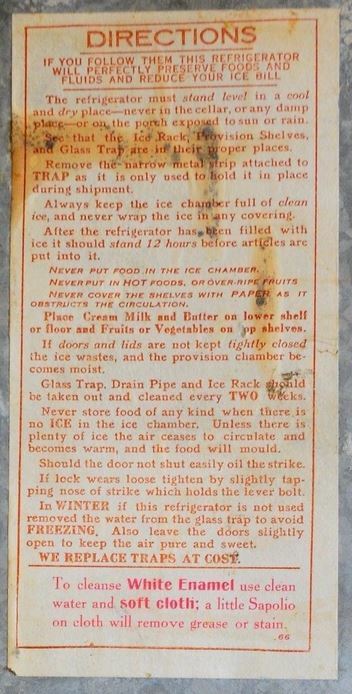 Note: traps are located at the bottom of icebox, at the base of the cabinet. The section opens (though no pictures were provided by this seller) to allow the ice-melt to be drained. Icebox for sale on ebay. This image is the name plate of the manufacturer. 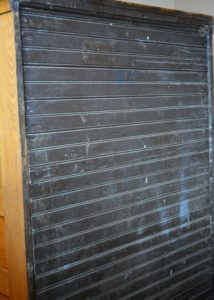 Back side of Icebox, currently for sale on ebay. Note the casters (rolling wheels) apparently original to the icebox, indicating the piece was moveable, perhaps to clean behind and to sweep beneath. 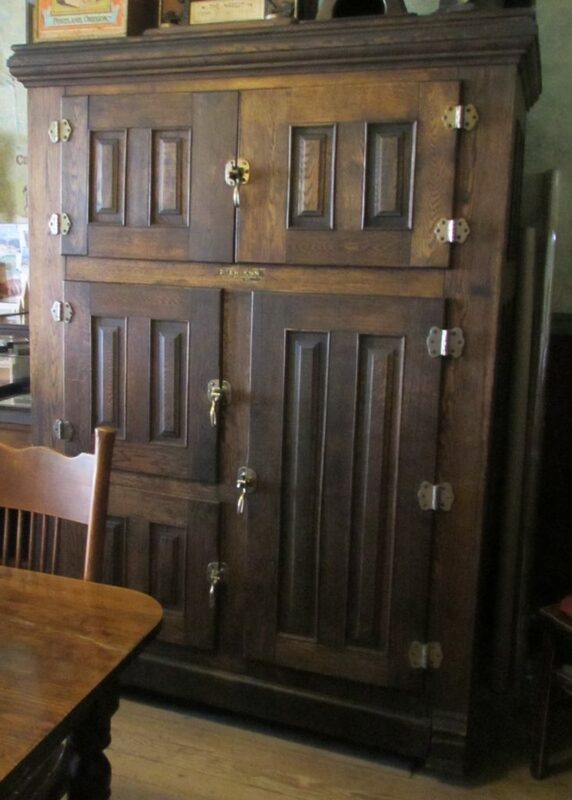 This icebox is currently for sale on ebay. 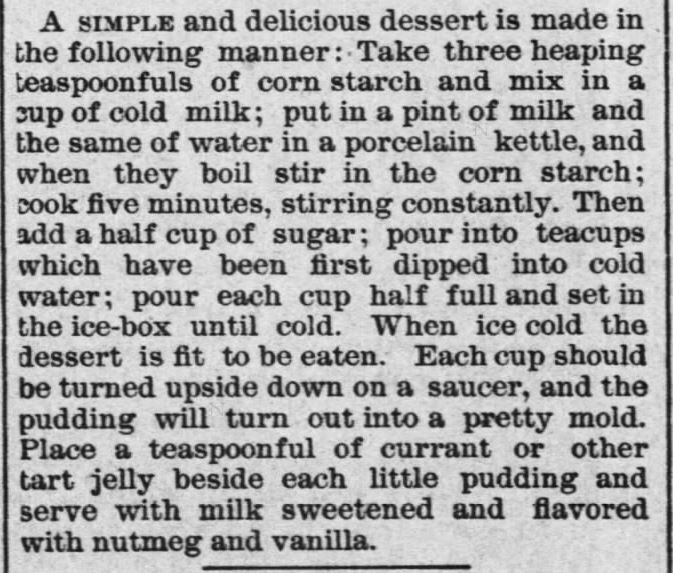 Advertisements in newspapers throughout the United States from 1866 to 1900 make it evident grocers kept fresh meat, butter, milk, cream, fruits (often transported in ice cars from a great distance) in iceboxes of commercial size. 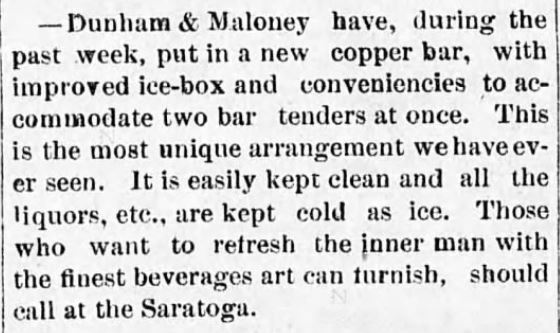 Saloons kept and used large iceboxes such as the one pictured below, in order to sell cold drinks to their customers. Industrial Ice Box. Dining Room of Historic Idaho Hotel in Silver City, Idaho. June 2016. Image: taken by Kristin Holt. This commercial-sized ice box is more than five feet tall–probably closer to six. 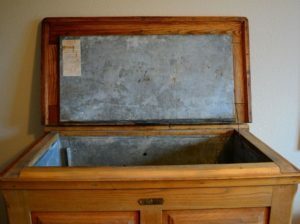 Iceboxes were also called “ice chests” (reminiscent of today’s cooler’s / ice chests), some designed and used to hold multiple kegs of beer. 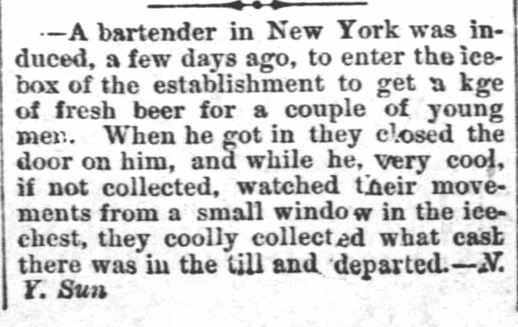 Bartender robbery in NY involves the walk-in ice chest and a keg of beer.The Osage County Chronicle of Burlingame, Kansas, on January 21, 1886. All those iceboxes wouldn’t keep food cold without a steady supply of ice. And in the city, at the peak of summertime heat, that ice had to come from somewhere. 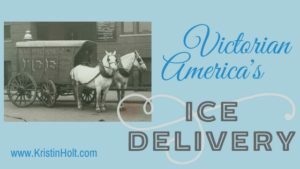 My blog post contains more information about ice companies, ice delivery, construction of ice houses, and more. 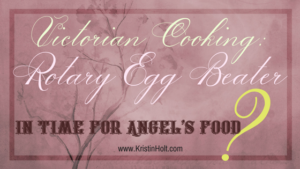 Read on for the amazing ingenuity of our Victorian ancestors. What a wonderful family heirloom! I’ve heard of “refrigerators” from the late 19th- and early 20th-centuries that have water spouts for cold drinking water (from ice-melt)…but not as a separate tank (with water added to become cool). Interesting! I wish I knew more. I’m far from an antique specialist. I research for my own interest and to share with other amateur historians. I recommend “Googling” (search via Google.com) the details you know, such as the metal plate and brand name, and pursue all leads that way. Every day, more content is added to the internet making resources findable that weren’t there earlier. If all else fails, an antique dealer in your city might be able to direct you to a specialist.